Wow. I didn’t think I could pull these darlings off. Seriously. I’ve baked 4 different batches, with variable results. Sometimes brown, some mushy, some over sweet, and just , one was plain out nasty. Vegan Dye Free Gluten Free Red Velvet cupcakes are not an easy beast to conquer, apparently. Especially without xanthan gum! However, I think I so totally pulled these babies off. They are perfectly sweet, have a thick crumb but not crumbly at all. They have a lovely fruity under note from the strawberries and the beets. Best of all? My gut is pretty darn happy with them (thank goodness. I’ve tasted far too many of them today so I would know by now if I was going to start tripping out lol). Here they are- in all their natural genuinely red goodness. The secret? Lemon juice instead of baking soda. You want the batter as acid as possible, and I’m so glad for the inspiration from My Diverse Kitchen! Now, I would like these guys to rise a bit higher, but for now, they’re fabulous. If you want to ice them, take a look at this post for some ideas. Visit this recipe, and other treats at Cybele Pascale’s Allergen Friendly Link Up Page- and submit yours! Note: Prepare and mix the wet ingredients first, so that they have time to soak and gel before adding them to the dry. This makes for a better batter! Put the shredded beet, strawberries, and water in a blender (I used a magic bullet and it was perfect). Blend till smooth. Measure out 1 cup of the puree and put in a bowl. Add to the bowl the rest of the wet ingredients, and make sure to sprinkle the agar powder and mix it all thoroughly. In a separate bowl mix the dry ingredients. Push through a fine sieve to get rid of the lumps. The large clumps of coconut sap, break down as much as you can, and whatever’s left dump back into the dry ingredients and mix. Add the wet ingredients to the dry. It will seem like a dry dough- don’t add more wet ingredients! The crumb of this cupcake is already quite moist, you will make it turn into gum if you add more wet. (I think next batch I may just add more baking powder or a pinch of cream of tartar to help them rise higher). Bake at 375 for 20-25 minutes (or longer if needed). NOTE: Did they seem undercooked in the middle? Are they brown instead of red? You might have a bit too much batter in each cup, try using a level ice cream scoop. When baking with agar powder, it takes about 2 full hours for it to cool and set. What may seem undercooked as soon as its out of the oven, after a few hours, turns out just right- thats the agar solidifying. Check your almond flour. If its Bob’s Redmill, it will be too granular and the recipe won’t work- try regrinding it in a coffee grinder or getting it from JK Gourmet or Honeyville. Double check your lemon juice and cocoa powder- it must be fresh lemon juice and non-dutch processed cocoa powder. Otherwise, your cupcakes will turn out brown because the batter is no longer acidic. Last- try reducing the coconut sap by 3-4 tbsp. Add 1-2 more tablespoons of coconut flour. ( Coconut sap, like other sugars, is a humectant- it attracts/ keeps a recipe moist. Coconut flour is super absorbant it will soak up moisture like crazy and dry out your batter). Your website is fantastic. My son is allergic to eggs, wheat, nuts and dairy. 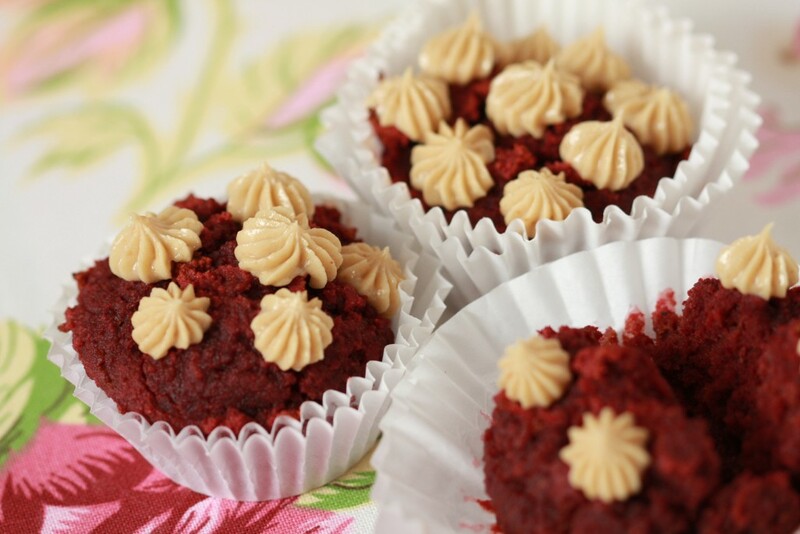 I want to make these cupcakes, but I can’t use the almond flour. I also noticed that many of your recipes use this flour. What can I use as a substitute? 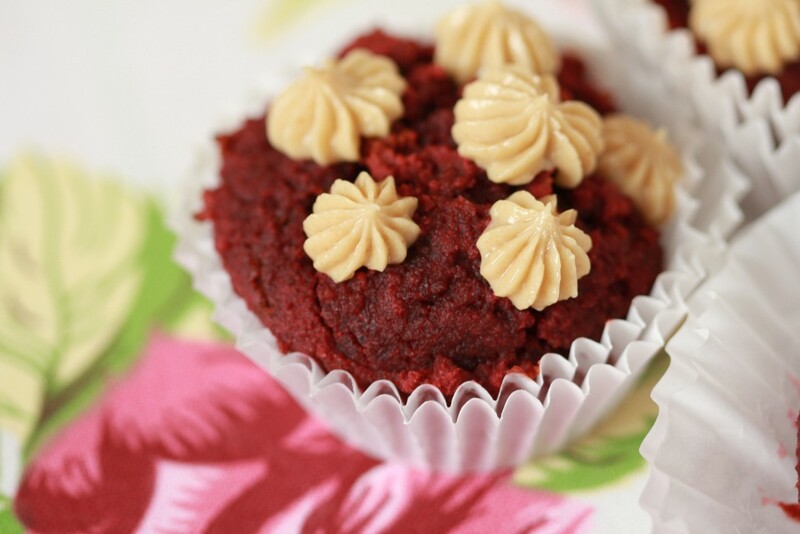 These red velvet cupcakes sound like a great way of hiding fruit and vegetables in food. Thanks for this recipe! I was a bit skeptical at the ingredients… beets?! But as far as my first foray into gluten-free, sugar-free, dairy-free baking goes, me and my coworkers were very happy with the results. What did you use for the icing ?? Lidnsay- my appologies for not responding sooner, so sorry about this- i’ve been working crazy hours and haven’t been able to get to the comments section… again, so very sorry! This looks good! Is the beet cooked or raw? So the birthday party happened. The cupcakes, I had both the red velvet and the chocolate, were a huge hit for the gluten-free,egg-free,soy-free,lactose-free crowd.Thanks so much for taking the time to post your recipes. Did you say no baking powder in the recipe at all? I’m sure I saw BP in the ingredient list. You are so great to answer posts so quickly. I did you use dutch processed cocoa and bottled lemon juice.Next time I’ll use the good stuff!! On another note I baked the cupcakes yesterday for a party today. When I checked today they came out of the cupcake papers perfectly. Nice and moist but not gooey. wow… well.. aside from using fresh beets and fresh strawberries, you need to make sure that the cocoa powder is not dutch processed. Also – the batter needs to be acidic- is the lemon juice fresh lemon juice ? (no baking soda or baking powder- those are alkalinic) bottled might have a different effect? These turned out super red for me- now I’m worried they might not turn out the same colour for everyone else- I’m going to see if i can redo the recipe in the next week or so to make sure. Other than that, perhaps lower the oven temperature to 325 or 350 and cook longer so the outside doesn’t brown? I’m wondering one more thing: What did you do to get the cupcakes as red as you did? Mine are a little more, well a lot more, brown than red. Good to know about the agar. I ground my own almond meal. So I processed it first and then finished it in a coffee grinder.I didn’t think I had too much batter per cup but I’ll watch that next time. Thanks for your other suggestions!! Ok, so this could mean a couple of things. First, you might have a bit too much batter in each cup, try using a level ice cream scoop. Next, when bakingwith agar powder, it takes about 2 full hours for it to cool and set. What may seem undercooked as soon as its out of the over after a few hours turns out just right- thats the agar solidifying. Next- what kind of almond flour are you using? if its Bob’s Redmill, it will be too granular and the recipe won’t work- try regrinding it in a coffee grinder or getting it from JK Gourmet. Next: Try reducing the coconut sap to 1/2 cup and adding 1-2 more tablespoons of coconut flour. (Coconut flour is super absorbant – when stuff turns out undercooked, its because the bater might be too wet. The coconut flour will absorb the extra moisture quickly and fix it). HI, I just finished baking these cupcakes. They are absolutely delicious. One question though: in my attempts at gluten free baking I don’t seem to be getting the items done properly. They tend to get overdone on top but are still too moist in the centre. Is this a usual thing or could my oven be too hot? I was curious to know why there is no fat source in your cupcakes – not even a few tablespoons of oil? Hi. Did you post the fluffier cupcake recipe? I can’t find it. I’m looking for an everything free cupcake for my daughters birthday. Each guest needs something different and I want to make sone amazing healthy, vegan, gluten free, sugar free, no weird substitute cupcakes. Thanks. Please email me a link. 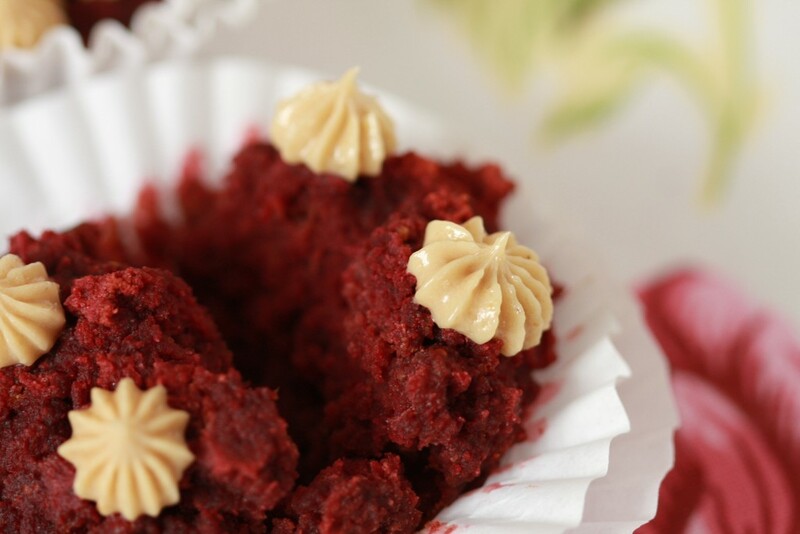 If not, I’ll try these red velvet.